Crescendo in Blue: Can Underdog Win High School Jazz's Top Prize? Some of the sweetest beats in Manhattan on Friday will come from the brass and strings of 24 young musicians who’ve roamed far from their hardscrabble Florida town to lay it down at the country’s most prestigious high school jazz competition. The jazz band from the Osceola County School of the Arts –- a 900-student school located in a financially frayed community on the fringe of Disney World –- already has bested nearly 100 other high school ensembles by landing an invite to compete against 14 other groups at the annual “Essentially Ellington” contest at Jazz at Lincoln Center. Osceola, a 6-12-grade arts school that enrolls students through auditions, represents the rugged realities of its community. In Osceola County, the per capita income is $19,728 and 16 percent of the locals live below the poverty level, according to the U.S. Census Bureau. Three student-musicians at the school are homeless. The band’s director, Miguel Alvarado, has tuned up a secret game plan for their set Friday. And there’s one more soaring note to this score: Osceola had never before even submitted a tape for consideration. Their big moment carries an underdog charm –- it’s like “Hoosiers” with horns instead of high-tops –- but these teens are playing to win. "My school is a little over 60 percent Latino, so we’re definitely going to bring that Tito Puente sound." 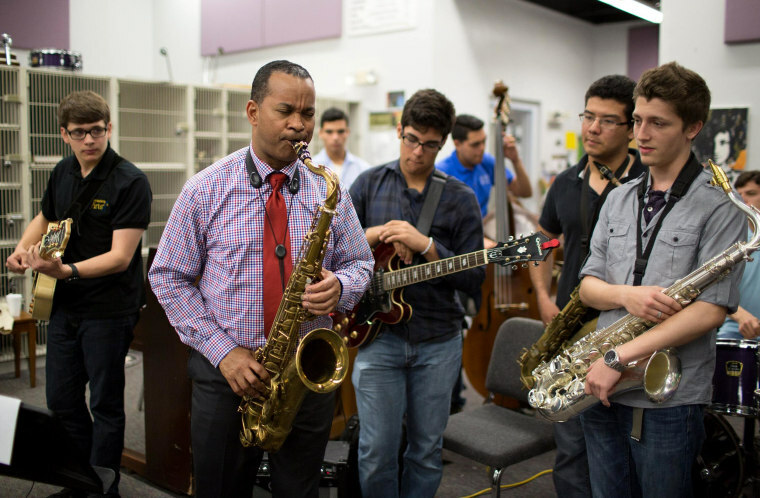 “It's great to see a set of kids come together for a common goal in today’s modern age, when so much of what we focus on in America has to do with the individual,” said Victor Goines, a saxophonist and clarinetist in the Jazz at Lincoln Center Orchestra. He’s serving as Osceola’s assigned mentor at the musical throw-down. He recently visited their Kissimmee campus to give them a listen and some advice. Each band gets a 20-minute window to perform a repertoire of hits made famous by jazz legend Duke Ellington, playing before a panel of elite judges that includes Wynton Marsalis, trumpeter, composer and artistic director of Jazz at Lincoln Center. The winners will be announced Saturday night. These days, jazz seems like a rarefied art form, but many of the sound’s greatest practitioners, from Louis Armstrong to Charles Mingus, came from rough and tumble backgrounds. Alvarado, who started open-mic sessions at a Kissimmee pizza joint, knows that well. “For the students, they have to figure out: how do I fit into this music?" That sensibility strikes a personal chord with Goines, who says Ellington’s music was and is about “the continual conversation between the instruments.” Through solos, many of Ellington’s players back in the day became stars -– Johnny Hodges, Cootie Williams, and Cat Anderson among others. But Ellington kept those “heavy personalities” in check to create a complexly textured sound that’s never been articulated by any other ensemble, Goines said. He adores the notion that modern musicians might latch onto to Duke’s jazz-fueled life lesson. While in Kissimmee, Goines was quietly approached by the band’s baritone sax player, Ryan Bishop. During a performance of Ellington’s “I Like the Sunrise,” Bishop, 18, wailed on a solo, trying to mimic Ellington’s baritone sax great, Harry Carney. “Jazz is about the experiences that help us become what we ultimately want to be." “Am I getting there?” Bishop asked Goines, referring to Carney’s resonance and power. “You are starting to get there,” Goines told him. Bishop, too, comes from a financially stressed home –- a home now in foreclosure. A bank is allowing his mother and Bishop to stay there until the property is sold at auction. After that, they will move to an aunt’s house. Goines definitely heard the familiar notes but said he also saw a palpable hunger for music in Bishop, who intends to continue his sax playing in college. “I hear Harry coming out in him already. But I want him to know something else: What we do is not about where we arrive at, it is about the journey we take to get there,” Goines said. “Jazz is about the experiences that help us become what we ultimately want to be."